Micron Technology, Inc. (MU) is indicated to open lower this turbulent Thursday morning in the stock market. The share price of MU has been trading sideways since the end of October so it will be important to look closer to see if the action has been dominated by buyers or sellers. In the daily bar chart of MU, below, we can see a bearish alignment of the moving averages. MU is below the declining 50-day average line and tested/failed at the underside of it the other day. The slope of the slower-to-react 200-day average line has turned bearish. In late August we can see that the 50-day line crossed below the 200-day line for a belated and bearish death cross. The daily On-Balance-Volume (OBV) line shows a decline from June to late October telling me that sellers were more aggressive. During November the OBV line has crept higher suggesting that traders have turned more aggressive on the buy side. The trend-following Moving Average Convergence Divergence (MACD) oscillator crossed to the upside in early November for a cover shorts buy signal. The oscillator is close to the zero line for an outright buy signal but not there yet. In this weekly bar chart of MU, below, we see a mixed picture with the indicators. Prices are below the declining 40-week moving average line. Support has been developing around $35. The weekly OBV line shows a decline to late October and then a small rise. The MACD oscillator is below zero but it has been narrowing for a number of weeks. 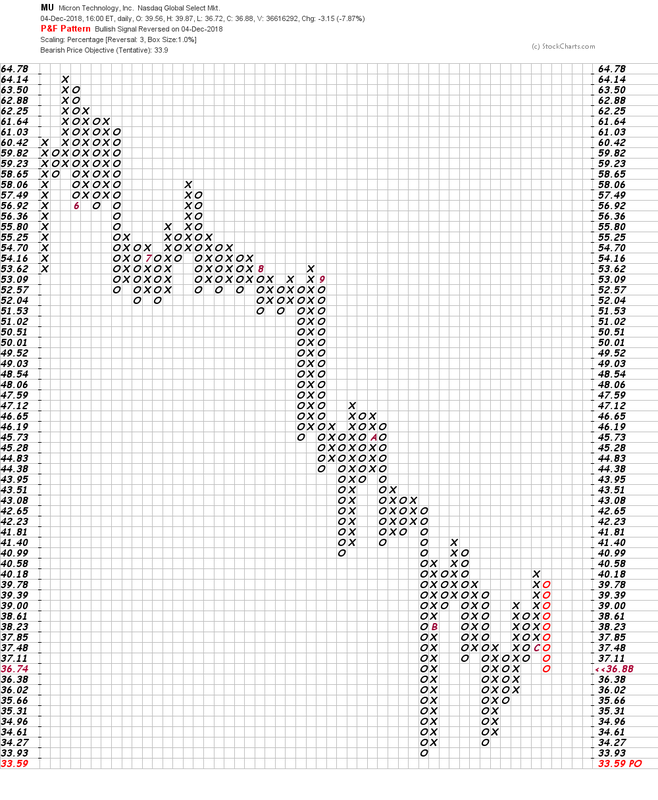 In this Point and Figure chart of MU, below, we can see a downside price target for MU that suggests we retest the October/November lows. Whether prices hold or not is another question. Bottom-line strategy: After Tuesday's stock market rout and Wednesday's closure, Thursday's lower opening will be a "nail biter" as they say. My gut is telling me in an unscientific way that MU will hold the recent lows.